This month, most of my collegues and friends are on vacation, the collective cooking will be back hopefully at the end of August. The next few weeks will be about some dishes I made. I miss the taste of freshly baked crisp and it has been months I haven't bake one. 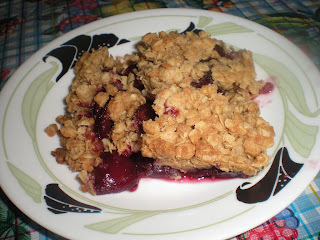 This is still cherry season, why not make a cherry crisp. 2. 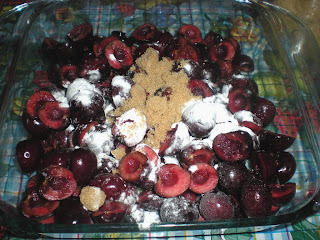 Mix pitted cherries with cornstarch and 1/4 cup brown sugar. 3. 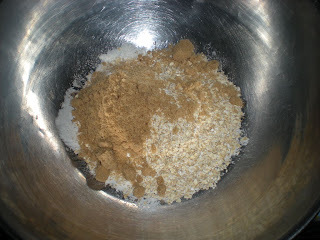 In a medium bowl, combine flour, oats, cinnamon, brown sugar and margarine. 4. 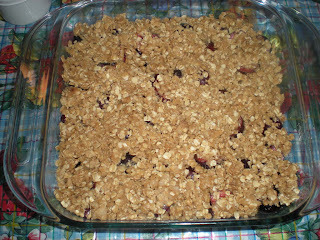 Place cherries in a 8 x 8 inch baking pan and top with the oats mix. 5. Bake for 45 mins until golden brown and bubbling. 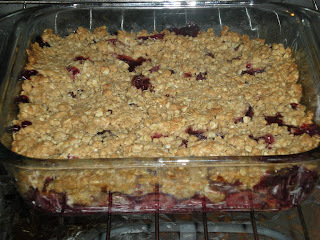 I'm craving cherry crisp now. looks delicious. I still have some cherries I think this is what I'll make. I don't have any brown sugar but I do have some demerara sugar left I it will probably work. This looks scrumptious. I wish I'd seen it before my trip to the grocery store - I'd be eating it now.